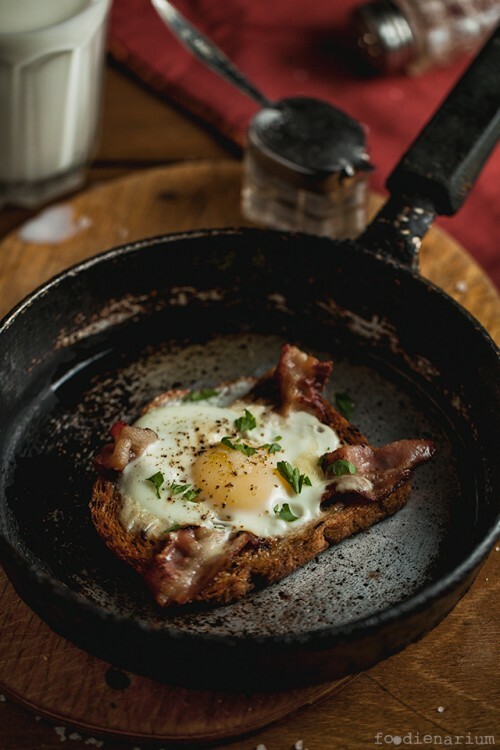 Fried eggs with a slice of bread and bacon are certainly not new, but you can serve it in a very original way, in the so-called ‘basket’. For many people, like me, this is important, as I quickly get bored with the monotony. There are more than 25 names for a recipe of the eggs in a ‘basket’. Some of them are quite funny, so I recommend you to look into the wiki and laugh. In most of them, this dish is a piece of bread or dough with an egg in the center. It is fried either on a pan or baked in the oven. I’ll show you a fairly simple recipe for baking in the oven. First of all take a glass and cut out a hole in the center of each slice of bread. We thrust the bread into the toaster, so it would become a little harder. You can just fry on the pan a little. You can also fry the bacon for a while. Now warm the oven to 180C (350F). While it heats, spread the bread on a baking tray. Put the bacon crosswise into the holes in the bread, so that it formed kind of a bottom. When the oven is heated, break eggs into the same holes, salt, pepper, and put it in the oven. Bake for 10-20 minutes depending on the grade of readiness of the eggs you want to get. When serving, sprinkle with chopped greenery for extra freshness.